I’m gearing up for the spring seed starting run over the next few weeks- it will be a big jump from what I managed to do last year. Christmas brought me a couple of new high output CFL greenhouse lights and an upgraded “real” heat mat to aid in germination (thank you mother.) More on that later……. 1. The garden was originally planted in 1934 and there have been many casualties over the years. Some sections were in good shape but others had damaged or missing bushes. 2. 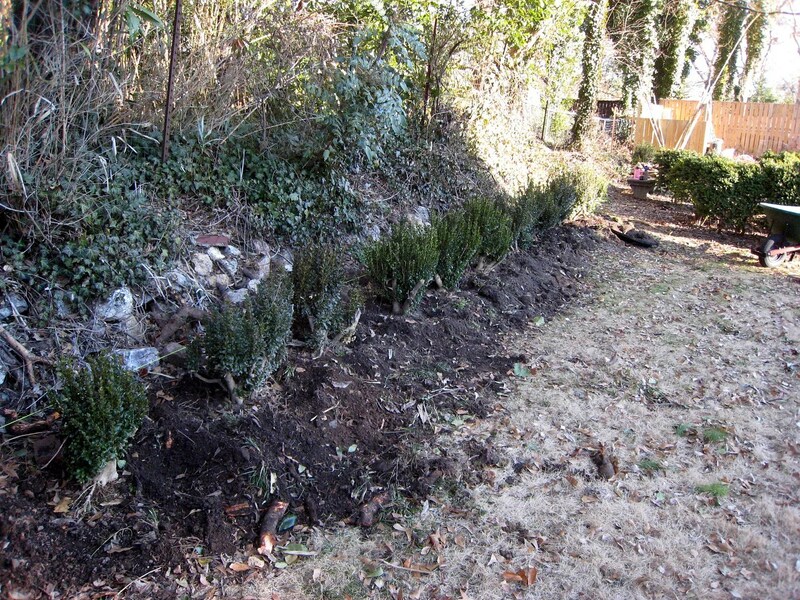 Sometime along the way, some of the more compact English boxwoods were replaced with common or “American” boxwoods. These are nice bushes but they created an unbalanced layout due to their different size and growth habit. 3. The original design was based on the assumption that the English boxwoods would be kept compact; the outside edge was actually a double row of bushes with a slate stone path in between. The problem is that 70 years of growth, even with slow growing English boxwoods, makes for large bushes and crowded conditions. I cut all of them back severely 20 years ago and it really didn’t take long for them to get too large again. 4. 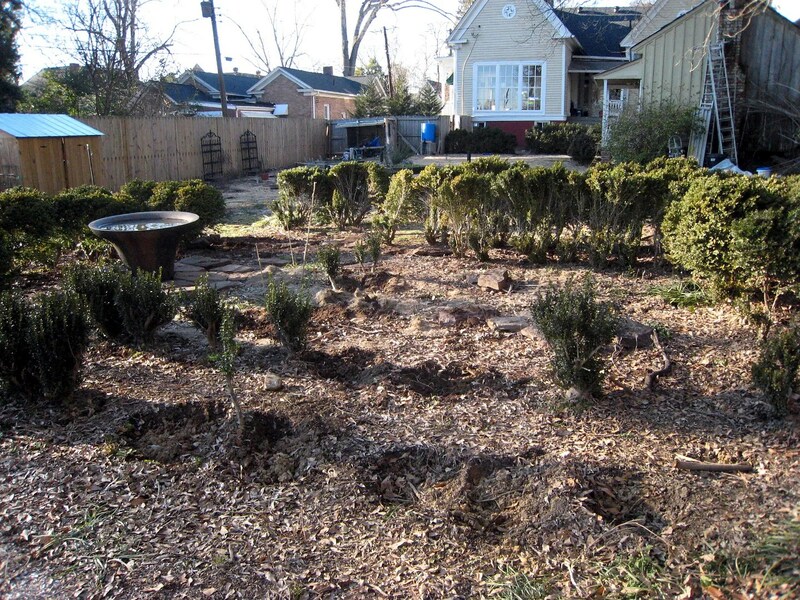 I wanted better utilization of the space- a nice area of sunny yard that was in between the two raised bed areas. Last year I cut all of them back at least partially (the American ones completely) in anticipation of moving things around this winter. 1. 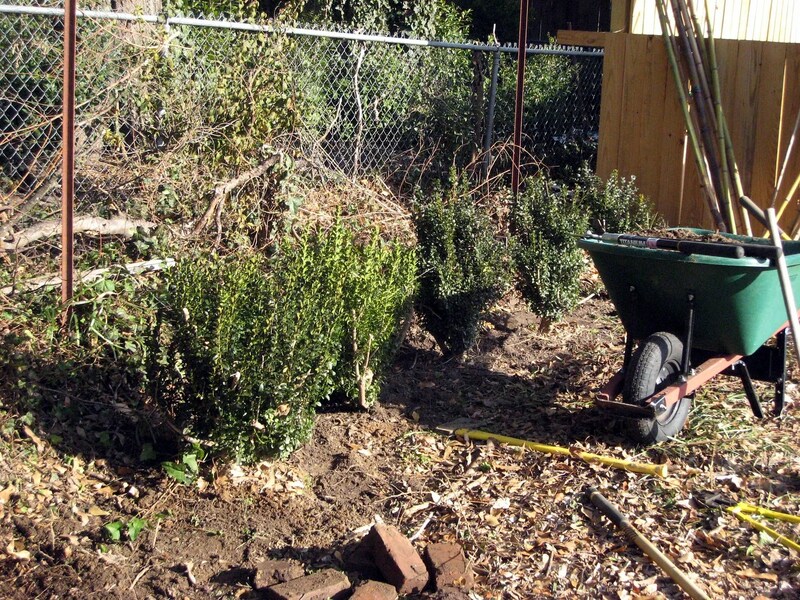 Remove all of the common boxwood from the garden. 2. Create a new border with them along my east property line (backs up to the neighbors “yards”. 3. 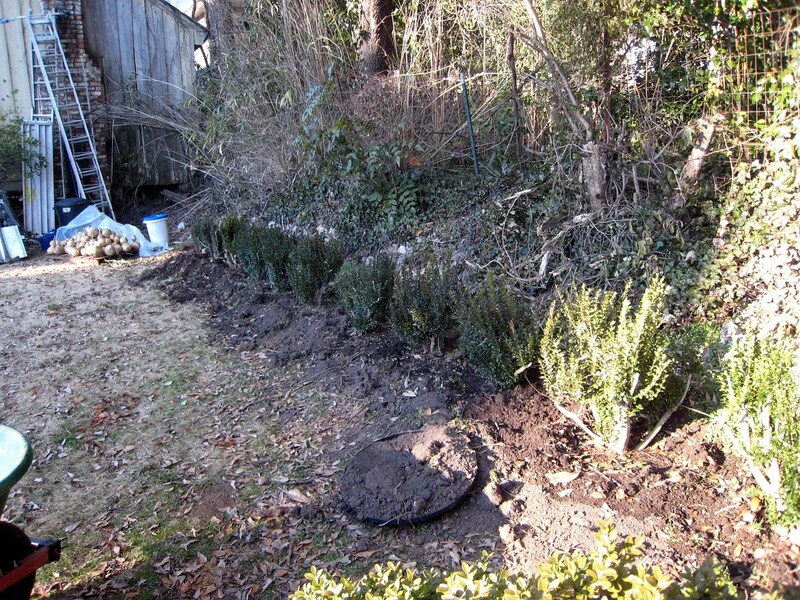 Move the good interior English boxwoods to the outside border (in the spots vacated by the common and the spots that had lost bushes over recent years from drought, snow/ice & falling limb damage). 4. In the opened up interior, install more raised beds and/or berries or artichokes or ? From the back, the shorter bushes are the common that I cut back last year. The taller hollow backed bushes are English that I pruned partially last year to let some sun into the interior to stimulate new growth. Looking to the east, I have moved some of the outside ring of common as evidenced by the holes (you can also see some of the reason why I want a better screen in the background). The second wave of relocated bushes along the lawn in front of the garden (I realize they are planted closely and unimaginatively in a straight line. 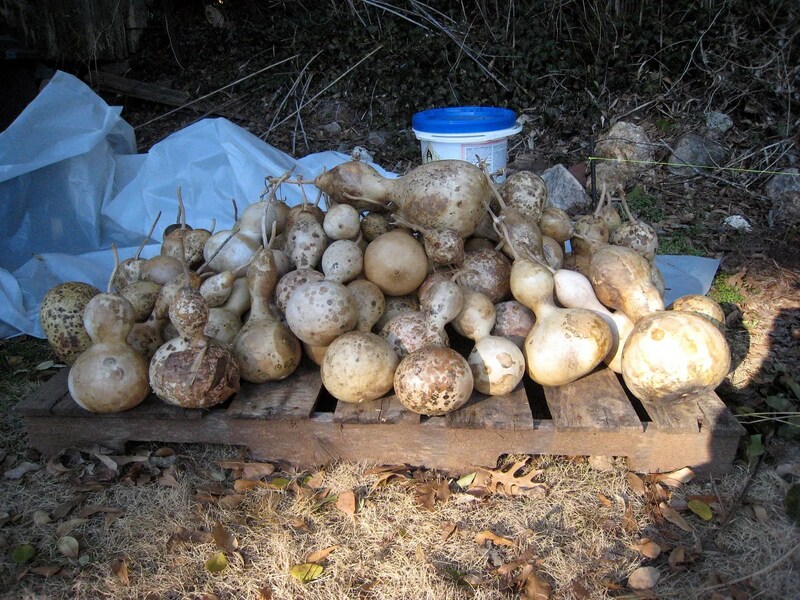 They are on 2 1/2 ft centers, roughly the same as in the garden. I’m just looking for a screen for now; There is room at either end of the light for some “adjustment” should I be so inspired later. .
You can see the gourd army sunning on the pallet in the background; this reminds me that it is approaching time to turn some into birdhouses. It may not look like a lot but I can assure you it is HUGE progress; tomorrow I should be able to move some of the English and continue to open up the center while replacing the outer ring with healthier specimens. It was hard work; I rewarded myself with the bowl of salad greens, radishes and broccoli shoots for dinner evidenced in the previous post. The report above was written Saturday evening; Sunday I did manage to start on relocating some of the keeper English boxwoods. 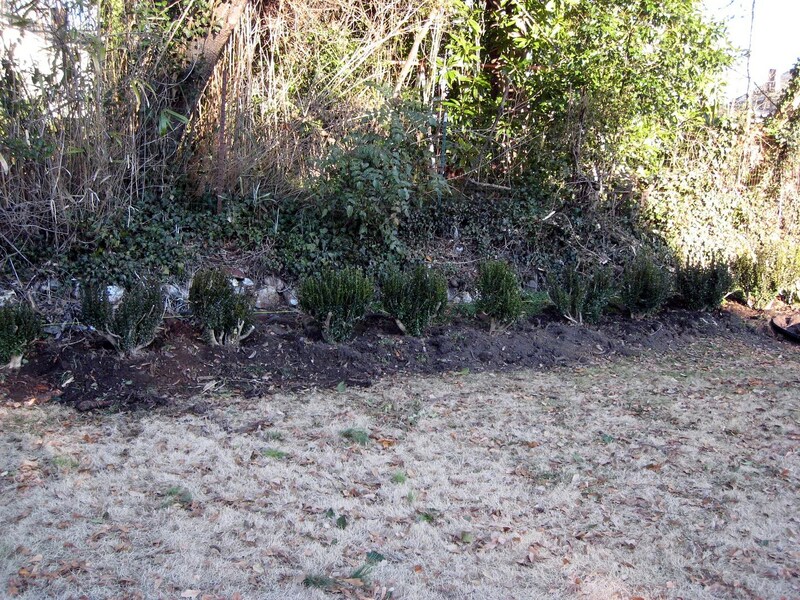 I moved 3 large ones, prepped several others and pre-dug several holes in the areas receiving new bushes. Common boxwood roots are fairly shallow and there aren’t any super large “tap” roots like you would see under a fallen oak tree. 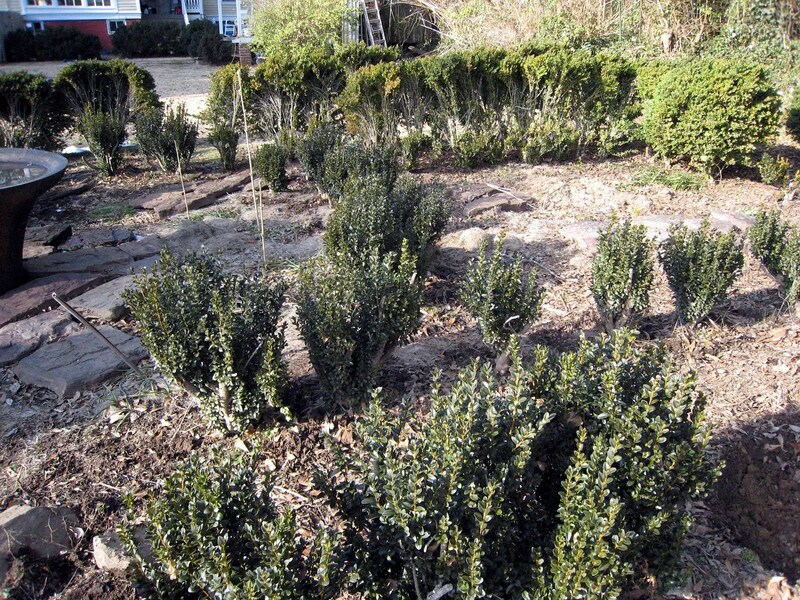 English boxwoods still have the dense shallow root mass immediately around the trunk, but…. they also have significant “tap roots” going straight down. 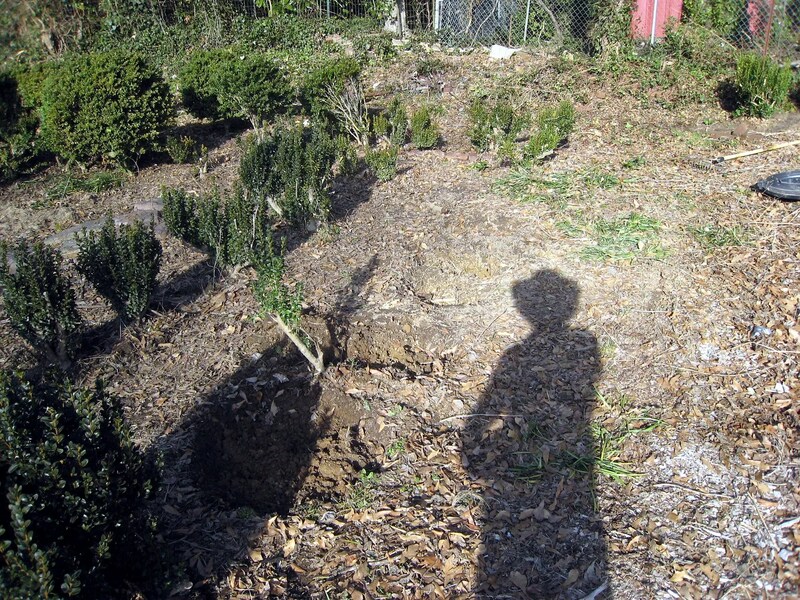 In other words it took much more digging to free a bush from the ground, a larger, deeper hole to place the transplanted bush in and some creative manipulating to get the bush at the right depth with the hole completely filled in around the deep roots. SLOW moving compared to the dozen common ones I moved Saturday ….